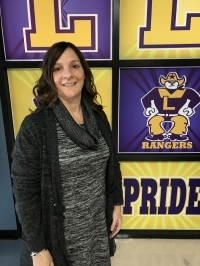 Speech language pathologist Beth Byrne may have been one of the Lakewood High School staff members most grateful for the completion of the construction project that brought the staff together all under one roof again. That’s because Beth spends her day running around the building attending to the needs of her 70 students strewn among the school’s many classrooms. “It’s definitely made the logistics much easier,” she said. Beth, who started with the District upon graduating from Ohio University in 1990, still loves what she’s doing after 28 years. “I enjoy working with the students. You get to know them, you get to see them grow,” she says. As part of her job, Beth sees students on IEPs who need help in a variety of areas, whether it is classroom work, homework or even learning appropriate social skills and language. Her goal is to set her students up for success in the classroom and beyond. Beth’s colleagues praise her for her flexibility and willingness to share resources that can help a teacher connect better with a student. District cleaner Erik Francis loves to tell people he is a proud 2003 graduate of Lakewood High School. Now, he is equally proud to work for the district where he attended school, and the work he does for it shows. Erik, who usually works at Lakewood High, has been subbing at the Board offices for an injured colleague since September. He quickly established himself as a smiling face around the building, eager to help in any way he can and provide some levity with his gentle wise cracks and jokes! Despite the humor, Erik takes his job very seriously, always double checking with staff to see if anything else needs done once his responsibilities are met. Lisa Bruening, director of Student Services, added: “Erik takes the time to ask how you are doing and listens….Erik truly cares about the people he works with!” He has even gone the extra mile by paying regular visits to his recuperating colleague to see if she needs anything. Erik, who has been with the District in some capacity since he graduated, has a positive attitude that is contagious. It comes by him naturally, he says.